…a room with a floor of sand. “Amphorae,” I pronounced; empty, of course. “This is an easier choice to make,” they said. One should never accept the obvious here. If you think of the Maze as a machine, confusion is its product, and the machine was hard at work. ● The obvious correct door is 45. Those are EWERs. (Approximate or effective homophone of YOUR, depending on regional pronunciation.) That’s why those things are here. I like it! Now explain the sand floor. Don’t have much to say about the sand yet. One of Jack’s non-crazy ideas was that it was related to the hourglass image that accompanies the hidden door to 17, and I find that a compelling possibility, especially as we have, in entering that door, turned the hour glass upside-down, in some manner of speaking. I would also note, for what it’s worth, that although the 16-step path is always mapped out as a figure eight, that’s partly arbitrary, and it could just as easily be drawn as an hourglass. 45 (Path): through the castle gate into safety. This is fitting, as 17 is the first room on the Path that is not reachable by the casual explorer, and our reward on entering it is a vision of the kinds of doors that we have so painstakingly discerned from one another. The party never ends… Welcome to The Abyss! Could be something to that! OK – let’s try V3.0 here. He starts with “amphorea” as a word with good potential that he wants to use. In order to clue us we are free to add an ending he puts blanks on the sign. Without the blanks the sign could still give us “Y O U R” for the riddle of the path, and it could still give us “Why oh, you are…” to clue 6 as the place to start the riddle of the guide with only one blank. He gives us two blanks to try to say we can expand amphorea slightly, so we get “am for raven”. Or in a larger context with different punctuation – “am for ray”, I, pronounced “empty” – where the “pronounced empty” is the “ven” that we fill in. NOW he gives us the sand – very “part”icular stuff, to clue us we can shuffle the pieces. Result “For I am Raven”. Think “arm of raven” = wing. This is what I have so far: Narrative: “maCHINE(SE)” “COMFU(CIUS)sion” = “Chinese Confucius.” “Amphorae” = AMPHORISMS” = what Confucius is famous for creating = “good advice”. Confucius lived in the Zh(OU) Dynasty. Confucious say, person who solve riddle with sledgehammer and corkscrew have ironic twist of fate. Confucius does raise a good question, if people really weren’t walking through doors back in ancient China. Oh, but I just consulted my copy of The Big Book of Facts So Obvious They Don’t Need Any Authority to Support Them, and it turns out that the ancient Chinese DID use doors all the time, both for leaving AND entering rooms. It turns out Confucius’s question was premised on a false assumption! How fitting in a room that reproaches assumptions. Bravo, Christopher Manson. Confucius say, man who walk through door sideways is going to Bangkok. The sign serves two functions. It is “your” for the riddle of the path, of course. But it is also over that little crawl to 6. “Why Oh, you are…” and in that sense it tells us that 6 is where the riddle of the guide starts. This helps explain some of the bits about accepting the obvious. “Your” choices being limited and muttered to “self” is a little inter-room red herring to 43 I think.Might be something more going on with the “empty” and blanks. Still clueless about the sand except for artistic purposes. Welll…here’s what I have. “part” is taught to us in 43. There is a “sly look” there which once we know “look” words are important for the guide might help us key in on this room. “part” then signals places in MAZE where we can take words apart to find “raven”, other birds, and other raven related things. There is a potential red herring connection to 43 here as well. And sand…is certainly particulate. So my theory is Manson is giving us license to really play Maze scrabble here – basically that let’s you build an answer you pretty much know is there, but it would never help you find anything in the first place. “Amphorae” is darn close to “Am for raven”. But the best place to find the missing letters to complete raven is far away in the text, but again, maybe the point of the sand give us this license. “One should ‘never’ accept. That also contains 3 letters for raven. If we buy that then we have “am for Raven, I ( or eye)…and this then is how he pronounced the final “empty” on the sign – something like “Why oh you/I am/are for Raven”. But again, you have to already know that the guide is Raven and that part words are special, and then this only maybe works. My problem is – why place a puzzle that you could really only get after you knew the answer? So, I’d like better, but that’s the best I have. Why would Manson hide phrases like “am for raven” and “I rare bull man”? Why wouldn’t he start with grammatical phrases that make sense? Well, taking “amphorae” to mean “am for raven” isn’t an anagram. I don’t know what it is, but it has the same problem. You don’t start with the phrase “am for raven” and turn it into “amphorae”; you only ever dream up that connection by working backwards…and it doesn’t even work then! I was with you about looking for more puzzles like 45, but I think you need to take that seriously. Moving from the word he wants to clue to how he wants to clue it, you can follow the steps Manson took in transforming words in a straightforward way. (Except the awl/nun split, where there’s no good explanation known for picking “all.”) You can start at the beginning and see what he’s trying to clue and why and how he does it. He sure as hell did not start with the phrase “am for raven” as the message he wanted to encode for the reader. But ok, let’s imagine he did. What about the second syllable of “raven.” Isn’t “raven” the most important word here? Why don’t we care about that second syllable? Since “am for raven” is basically just word soup, does this mean that any word containing at least one syllable from “raven” would have been sufficient to contain a clue to “raven” as long as we could either pronounce the remaining syllables as words or pronounce them as something LIKE words? Whenever the number 7 appears, is that a clue that we “see [ra]ven”? Well, I’d say we started with nonsense and came full circle, but we really just never moved. If he wanted to create a phrase suggesting that guide is Raven, why not “I am Raven”? “He is Raven”? “The Guide is Raven”? “Raven”? Why not something that somehow communicates in at least approximate English syntax the intended solution? As difficult and unfairly constructed as the Riddle of the Maze and the Riddle of the Path are, they are never anywhere as bad as this. And they never involve any kind of reasoning like this. WHAT: Requires thinking of an object in terms of its written name, and adding a letter (which appears in the room) to it to make a new word. HOUSE: Requires seeing the horseshoe as a U on account of its shape, and thinking of an object in terms of its written name, and combining the two in an anagram to make a new word. WILL: Requires recognizing a common missing element from two rebuses. ALL: Requires thinking of two immediately unrelated words as homophones of opposites; requires choosing between them (basis unknown). IN: Requires treating an eye as the homophonic letter I, and treating an ambiguous symbol as an N instead of a Z. 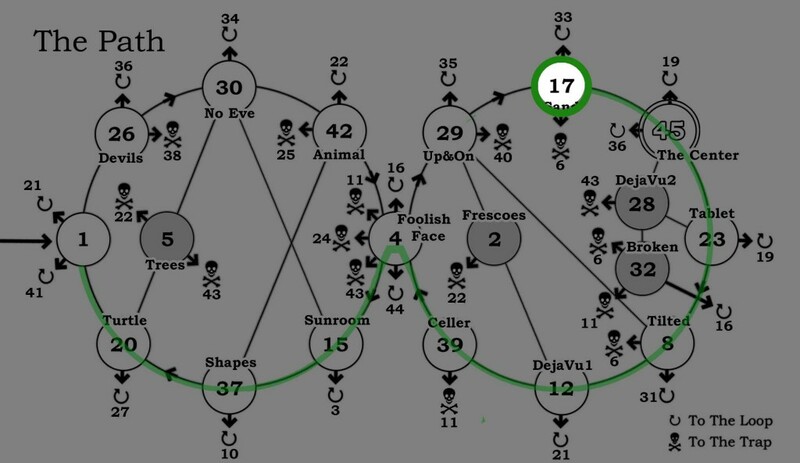 Forget about how hard it is to group and solve these puzzle bits–starting with the words and moving forward, Manson used very traditional puzzle techniques to encode words. Those are the kinds of puzzles I suspect we’re missing. And we may never find them, because they may be impossibly difficult to find. But one advantage they do have over complete nonsense is that these kinds of encoded phrases are also difficult to imagine where they don’t really occur. At least, if they’re going to add up to something. You could take the S in Room 8 and add it to the PIN and say that makes the word SPIN, but it doesn’t get you anywhere. You could say, “Oh, that means we SPIN the candlestick around and it points at the right door,” but then you’ve interjected a step of nonsense. It’s certainly not clear that all the puzzles in MAZE follow that kind of rational flow from COHERENT STATEMENT through COMPREHENSIBLE ENCODING METHODS, but I can’t think offhand of any good evidence that any of them don’t. Well, maybe that clue about the chair. IF he did make this amphorea puzzle approximately as I said, and I’m not at all sure he did – I would say he would have had to start with amphorea, not the other way around. Just because he was a person dealing with old archaic stuff a lot it was a word he had around him and he noticed the ending of the word was something he might be able to use in a puzzle, and then – didn’t do a fantastic job with it – on the other side of the coin – you are not supposed to just stumble across the identity of the guide – but still – point taken – it’s a poor one. I wouldn’t say this is an anagram – it’s the first 3 syllables of the 4 syllables expression “am for raven”. (Or if you include the next word and rearrange – I am for Raven) Actually – you know that sort of works better – both of the blank lines are seemingly missing an ending and that could give you an excuse to tack a syllable on the end of “Am for ra…” ven – the blank lines invite adding endings. Really I’m more just fishing around promising fragments. I think this little exchange improved the fragment a bit. Maybe there is something else around that could improve it more, etc… still fishing. Of course now I don’t know what to do with the sand again…. Now – “I rare bull man” – I really do think he placed – but I certainly don’t think he started with the phrase “I rare bull man” and got to rain umbrella. Rather – at some point he was just noticing features of the word “umbrella” (maybe he was already putting one in the maze for say the room 10 puzzle). The word “bull” is in there. “man” is nearly there. “n” is missing. And there is an extra “re”. He wants to use it – but he will need to find a word with “n” that will make some use of the “re”. It does not take a lot of imagination to come up with “rain” as a trial word if you are looking for words with “n” that have something to do with an umbrella. So now he has “bull man” and left overs “re” and “rai”. Pull out an “I” and “rare” is not hard at all to see. So he ends up with a phrase that has something to do with a “bull man” based on the inspiration he had from umbrella. Or, maybe he didn’t do anything like that at all and the umbrella that is pretty clearly intentionally set up as a fake guide just happens to have almost the right letters for “bull man” the major fake guide of maze. It’s just coincidence. Maybe. Of course doing that exercise again may have made an improvement dawn on me – “an umbrella” = “a bull man”. Thing of it this way – he is doing some free association with his maze pieces – finding stuff that is not there, because no one could have put it there if he didn’t – but he, just like us can come up with interesting random coincidental stuff. Then he latches on to that stuff and reinforces it – so that the tie-in is not longer an accidental one. BTW – The secularist I am – I do know of a historical process that (in my view) went a lot like how I described. Text based religions have lots of text – and by coincidence stuff happens that relates things in unintentional ways. Someone latches on to some random bits they find and then tries to convince others of their find – with little luck. So they start modifying texts and making their own texts (or letters in the case of Paul) so that what was at one point just a coincidence is now an intentional part of the final text. And thus the tradition grows and changes. So if Manson did find random neat stuff, and then build around it – it would not be an unprecedented human undertaking. Actually, if you take the majority of the text to be referring to the YOUR sign, it makes a lot more sense. Their choices of letters to fill in the blanks are more limited than they know, because no letters are correct. Accepting the obvious (filling in the blanks) is wrong. Hurrying out the door, they ignore this advice while choosing the right room. “Pronounced” emphasizes the sounds of the words, i.e. that they’re letters. “Empty, of course,” as WR notes, acknowledges the empty blanks. Excuse me, I thought we had all agreed that the correct words to fill in the blanks are “gee” and “tea”. Good observations! This really rounds out the solution to this room, I’m adding it to the summary. Very well thought out. The un-”limited” door is that to 45, of course, which is (pretty nearly exactly, to my naked eye) as tall as the other doors, but without narrowing. Something potentially interesting going on here with the amphorae and the sand–the amphorae are declared to be empty, for some reason, and in a number of them we can see into their dark interiors. The surrounding sand is white. Now, the three wrong doors here are all dark, but the correct door leads to light–perhaps a connection between emptiness and darkness? If we can assume emptiness to be bad, which, come on, right? I don’t know whether the whiteness of the sand figures into it, but it serves as a visual contrast to the amphorae, and those are the two items highlighted by the text, and about the only things in the room, besides doors and decor. I don’t know what would make the whiteness of the sand seem attractive, however. On the one hand, the name “meander” recalls the twisting and turning path of the Maeander River in Asia Minor, and on the other hand, as Karl Kerenyi pointed out, “the meander is the figure of a labyrinth in linear form”. Not really a clue but I found it interesting. I want so badly to walk through that door and be at the seaside, forgiving the presence the sand, but all that’s there is that stuffy room with no windows. Do we have any proposed reasons for sand in the room other than mine? No, but considering the linguistic fortitude of the rest of the clues, I’d say S + AND could be something, especially since there are S shapes on 2 of the amphorae (maybe more). S + AND ??? and what? Maybe it’s in the picture. It may just be there because if there were a solid floor then the amphorae couldn’t be resting at the various angles they are, or have buried handles, etc. It makes it a lot easier for Manson to set then up how he wants them. This is the first time someone here has seriously pointed out that a major factor in illustration design is artistic necessity. Artistic necessity occurs in every room. These are not red herrings or intended distractions just things Manson had to do in order to create the riddles. It helps a lot in determining what is a riddle and what is not, to remember the elements of all the other riddles in a room and their necessary components. Man, I hate to say it, but “am-FOUR-EE” is starting to look a lot better to me. It’s almost just a question of how rampant alphanumeric coding is, and if it’s fairly rampant, then am-four-ee almost certainly didn’t happen by accident. I’m not completely sold, but I think my previous rejection was overstated. Vincent Watkins Maze flipflop # 52. Of course, one other reason why they shouldn’t leap to the obvious is that there’s part of a hidden message to find here. It says the group ignored his advice and “hurried” into 45. Maybe the guide’s point isn’t that they shouldn’t go to 45, but that they shouldn’t do so before examining the room. They ignore his advice not by choosing the wrong door but by leaving hastily. Interestingly (maybe), the group is never suggested to be picking up on the riddle of the path, but they are always suggested to be picking the right door. This reading preserves that pattern. Vewatkin, I am intrigued but I don’t follow you. As I understand it, if we ignore the intro and exit lines, line 1 is about the YOUR riddle, and lines 2-4 are about 45. It sounds like you are suggesting that line 4 is about the YOUR riddle. But alternately suggesting that instead lines 1-4 may all about 45. Sorry, misunderstood the last part of your previous post. Generally I find your posts clear and insightful these last two I’ve had trouble with. Maybe it is because I am trying to drink less coffee. I think I got it now, you are saying that the group is ignoring the guide’s good advice by not looking carefully or adequately for the riddle of the path. I don’t know… seems to be about the door, despite the problems this causes. It’s clearly meant to sound like it’s talking about the door decision. If Christopher Manson told us in person that he had never considered that interpretation, we would call him a liar. I see the problem and your solution solves the problem but it seems more straight forward just to conclude that Manson is messing with us because this room has an obvious correct choice. Manson tried hard to make every room difficult to choose the right door and this one is EASY. I think the guide’s thoughts are Manson, as you said, lying to us in order to throw us off and make us take the wrong path. HM, what is your question in response to do? There are too many of my long-winded paragraphs in this chain to know what point you’re referring to. Oh, I think I see what you mean. That’s a good point. 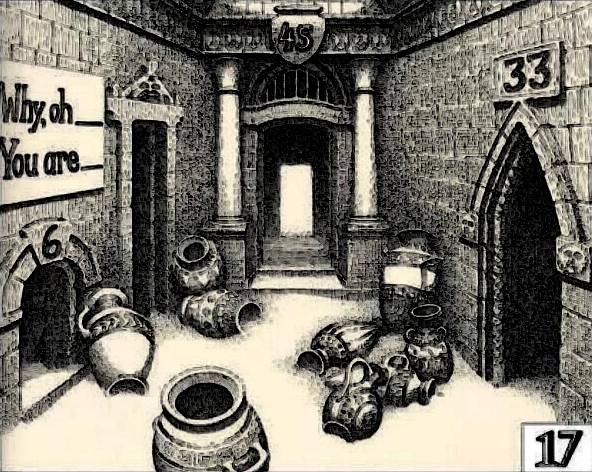 It may be that the illustration for Room 45 doesn’t contain a door indicator, but that the text tells in some way where to go. That’s a good hypothesis. The total number of handles on the jars to the right is 6, the total number on the left is 3. But on the right they are grouped together and on the left (the 3) they are in two groupings. Does this suggest 6 and 33, each opposite the corresponding door? Beats me, but there you have it. An interesting way to look at that is that you have 3 ___ 6, and 45 fills in the blank. I say it’s interesting because we then have comments about the amphorae (“pronounced”) that seem to relate to the sign, and things on the sign (blanks to be filled in) that relate to the amphorae. I suspect a lot of the text really refers to the sign; it’s a little trickier than it immediately appears that the blanks shouldn’t be filled in at all. It has been observed that YOGURT is one way to fill in those blanks. Another way, that preserves the division into two words, is to fill in YON URN, which, uh, refers to the 45 sign? More seriously, though, I suspect the “limited options” comments are directed at the fact that there not only few options to fill in those blanks–there are no correct options. The blanks have to be left blank in order to spell the word of the Riddle. As for disregarding the obvious, I wonder whether that is an admonition against returning here from 45. If traveling in and out of a Maze, the obvious route would be to return the way you came, ala Theseus and his string. But that will do you no good here. That’s also why this room contains clues to 45 when it’s already obvious you have to go there–if you come here after 45, you need to know to go back. Maybe that’s another reading of limited options: 45 is the correct door whether headed in or out. Vewatkin, if you forget about the blanks for a moment your 3456 solution is actually rather straight forward. 3 handles / 45 / 6 handles. Could it be that simple? It is more complicated with the addition of the blanks suggesting we fill in the 45 but either way I like it!